Jupiter is a popular garden apple variety, and best considered as a good alternative to Cox's Orange Pippin - to which it is closely related. It's an attractive-looking apple, with a marbled red/yellow colouring. 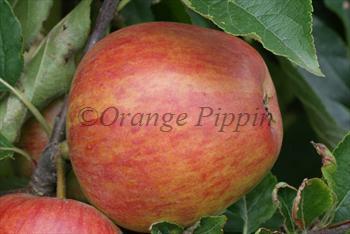 The flavour is very good, with some of the aromatic qualities of Cox's Orange Pippin - but more pronounced. Please fill in the details below and we will let you know when Jupiter apple trees are back in stock. Jupiter is in flowering group 3. Jupiter is a triploid variety and cannot pollinate other varieties. It needs to be pollinated by another tree of a different variety nearby. You can either plant a self-fertile variety (which will pollinate itself and the Jupiter) or you can plant two pollination partners which must each be of different varieties and able to cross-pollinate each other as well as the Jupiter. If you need further advice on this just get in touch. Since it flowers in the middle of the blossom season it can be pollinated by most other apple trees. Jupiter is easy to grow, and produces a large vigourous heavy-cropping tree. It performs well in both dry and wet climates and has good disease resistance. 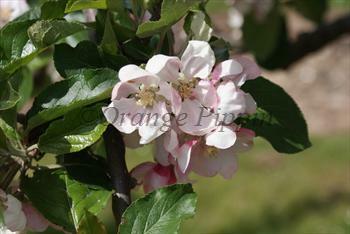 Jupiter is a triplod variety and will not pollinate other apple trees. However it flowers in the middle of the apple blossom season and most other apple varieties will pollinate it. Developed at the famous East Malling Research Station in Kent, UK, in the 1960s. Jupiter is a cross between Cox's Orange Pippin and Starking Delicious (a development of Delicious) and is thus closely related to another popular Cox-style apple, Kidd's Orange Red. Jupiter has a more robust flavour than Kidd's Orange Red.